One of the finest precision-made 3-piece, double edge safety razors available. Crafted from 100% stainless steel, the second generation FEATHER AS-D2 has reached the perfect balance when paired with the super-sharp FEATHER blade. 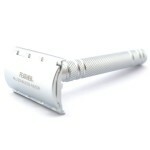 This razor is on the mild side and recommended for those with sensitive skin. A beautiful shaving instrument you will be proud to own. Packaged in a nice cherrywood colored gift box with 5 free FEATHER Hi-Stainless Platinum Coated blades.